I love Australian wines and the enchanting stories behind them. Take this delicious wine 9 Mile Road Cabernet Sauvignon from Langhorne Creek a little known yet very rich area of South Australia. "The name 'Langhorne Creek' acknowledges Alfred Langhorne, a cattle drover, who brought animals overland to a property known as 'Langhorne's Station' during the 1840's. 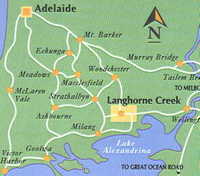 The place where Alfred Langhorne traversed the Bremer River was referred to as 'Langhorne's Crossing', and from this the current name Langhorne Creek evolved. Wine has been made here since the 1850s." For so many years we could only find good Greek restaurants in NYC, our favorites were places like Molyvos, Uncle Nick's and Periyali. 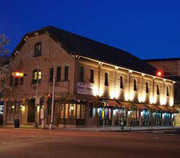 Now we have several choices in the Montclair, NJ area. We just tried the new Greek Taverna on Bloomfield Avenue on the corner of Greenwood. It is a beautiful place, in the former location of The Noodle Shop. 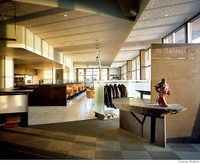 With an ambitious menu and strong management by the owners, it has real potential. We would rate it with a good to very good. Not bad considering they have only been open a week. Here are highlights from a recent trip to California. We started outside of LA in Thousand Oaks, Newbury Park, CA. Then up to the Ojai Valley, with stops in Santa Barbara and Carpinteria. After a few days there wound our way up the PCH to SunnyVale and Palo Alto. Our trip concluded with a few nights in San Francisco. The beau ideal of creative dining in San Francisco for decades. I have little to add to all that has been said about this great restaurant. When you travel to San Francisco be sure to include a meal here. My very good friend and favorite CPA Andrew Mitchell joined us for dinner. The meal was to be a Cuban medley around a great recipe for Cuban Flank Steak by Melissa Clark in the NY Times. Quicker, Cooler Way to Dinner in Cuba. Andrew brought two wonderful Spanish wines Emilio Moro, Ribera del Duero and Almira "Los Dos." They were both spectacular. Terlan Quarz Sauvignon 2006 is a spectacular Italian Sauvignon probably the best I have ever tasted. I have tasted many Italian Sauvignons. It is produced by Kellerei Canita (Vineyard / Cellar) Terlan is in the is in the small munipilaity of Terlano in Tentino Alto Aldige where many very fine Sauvignons and other great Italian wines are made. I learned something new today from across the pond. "To celebrate the launch of its latest wine, Bin 311, PENFOLDS is setting out to demonstrate that chardonnay is much more than the ‘signature wine’ of Bridget Jones and WAGS. Despite a number ABCs – anything but chardonnay - PENFOLDS insight shows it has always been a quality choice for those in the know, especially amongst palettes of discerning men. Recent research reveals that 65% of ‘wine loving’ British men choose this white wine as their drink of choice, ahead of other wines, beer and spirits." Well I stand improved! So good to know I can sip my chard without worry. People used to make fun of me for being a white wine drinker. Hah. No more! Brunello di Montalcino to be specific. It is produced in the vineyards surrounding the town of Montalcino located about 70 miles southwest of Florence in the Tuscany wine region. 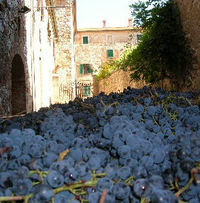 The grape, Brunello, "nice dark one" in the local dialect, is a clone of Sangiovese and is also known as Sangiovese Grosso. In 1980, the Brunello di Montalcino was awarded the first Denominazione di Origine Controllata e Garantita(DOCG) designation and today is one of the Italy's best-known and most expensive wines. To my palate it is the most perfect wine.